Years ago I did a series of evening cooking classes with Diane Seed here in Rome, which was great fun. She really demystified Roman cooking for us, and helped make sense of how to cook the piles of colorful strange produce in the market. I had never seen a fresh apricot before moving to Rome. I had never made pesto, or cooked agretti, or deep-fried zucchini flowers. Some of those recipes I still use. 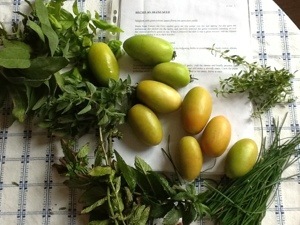 The other day my husband had bought some nice green tomatoes, with nothing specific in mind. I had been looking at the herbs on the balcony getting slightly weedy, and thought: “Diane’s green tomato pasta!” It is an uncooked sauce, which is great in the summer heat. (We are having a very cold week, but I am in a summer mood for cooking regardless.) While your pasta cooks, just blitz green tomatoes, mixed fresh herbs, garlic, parmesan and a splash of oil. It is a flexible dish, just use the herbs you have that go well with each other and with tomatoes. Some mint is recommended. Lovely light and fresh dish. Wash tomatoes and herbs, and and combine garlic in a food processor. Process to a chunky salsa consistency. Just before serving, add in the grated cheese and olive oil. season to taste. Boil pasta in lightly salted water (as long as the packet recommends). Drain pasta, spoon over some green tomato sauce and serve. 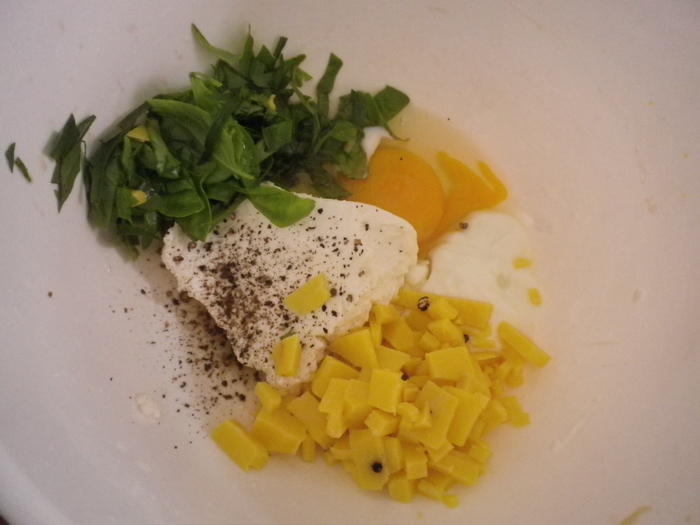 This entry was posted in food and tagged herbs, pasta, tomatoes on May 31, 2013 by krumkaker. 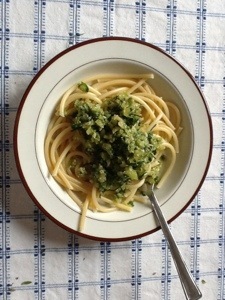 After making pasta with peas and ricotta on Monday, what to do with the leftover fresh ricotta? I’d seen a recipe for baked ricotta on Nueva Cocina, just the thing for a quiet May Day at home. It’s a public holiday here. Of course the soufflés deflated once they were out of the oven (must work on that), but they were very cheesy and tasty. Chop the herbs, mix all ingredients, bake in two ramekins: 190c for 20 mins until they have risen and are slightly golden. Notes: the original recipe called for cream and pecorino, but low-fat yoghurt and the saffron cheese we had seemed to work well. I buttered the ramekins but that was probably not needed. We bought the saffron cheese with peppercorns at the airport in Palermo recently, it looked more interesting than it tasted… but was nice here, and gave a lovely yellow colour. 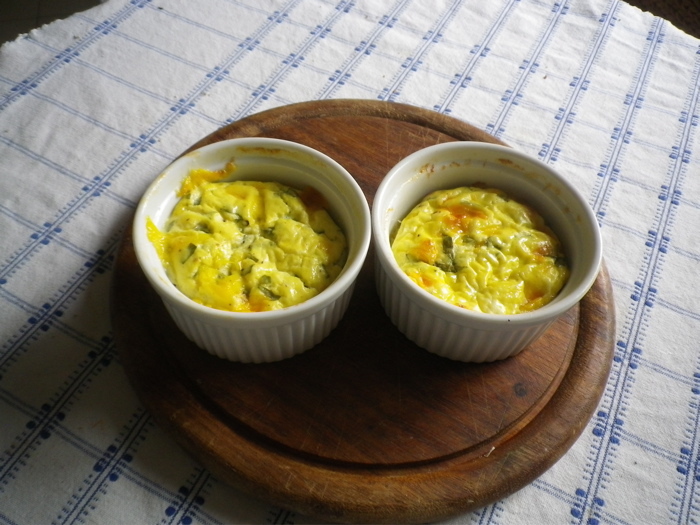 This entry was posted in food and tagged herbs, ricotta, soufflé on May 1, 2013 by krumkaker. Sunday in Rome, church bells ringing and it’s quieter than normal. Lovely sunny day, so we strolled up to the Rome Farmer’s Market in their new Garbatella location to have a look. Nice to see the old market finally in use again. Still many stands not in use, but an interesting selection of cheeses, salumi and other food items (who doesn’t like to browse that?). Definitely worth exploring further. My excuse (not that I need one) was the dismal state of the balcony boxes, and the rapidly increasing temperatures. 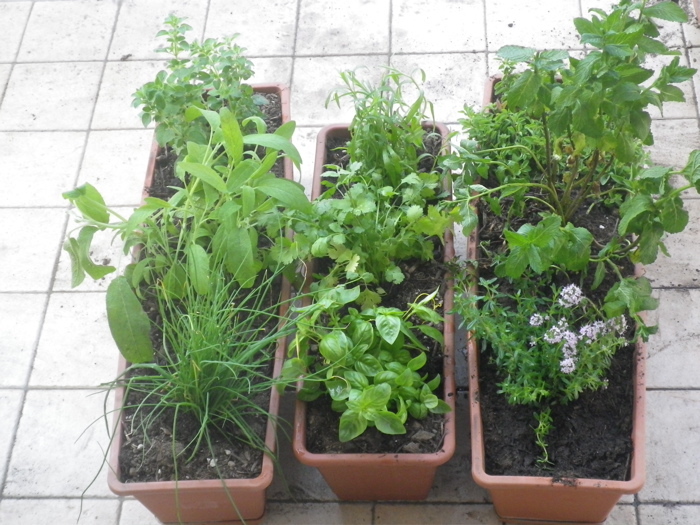 25C today: great for drying laundry, but not so good for fragile herbs on a south-facing balcony. I stocked up, and replanted three boxes. I also bought some fresh ricotta, to make pasta with peas and ricotta tomorrow. For recipe, see Rachel eats: Farfalle con piselli e ricotta. Her writing makes me hungry, and she even made the pasta from scratch……. Wonderful. UPDATE: it was absolutely delicious! I confess, we used frozen peas, about 200g peas and 200g fresh ricotta, half of mixture blended. then served with extra ricotta on the pasta as Rachel recommended. Just a bit of salt and pepper. Definitely one to make again. 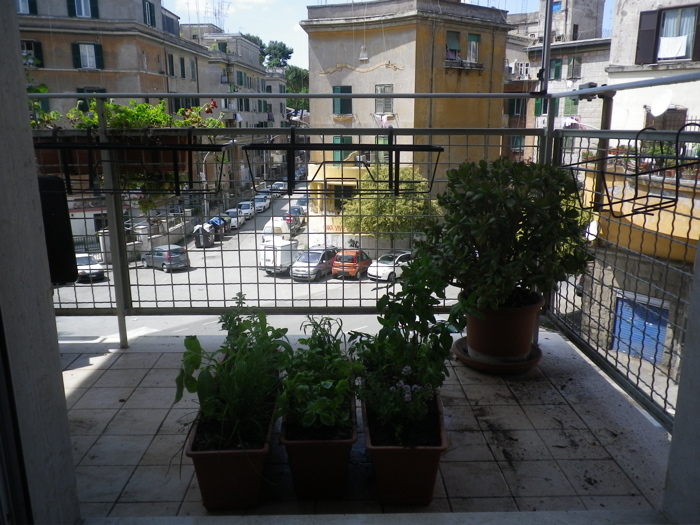 This entry was posted in Rome and tagged Garbatella, herbs, Rome, spring on April 28, 2013 by krumkaker.